Auto Follow Back who Follow you on Twitter. 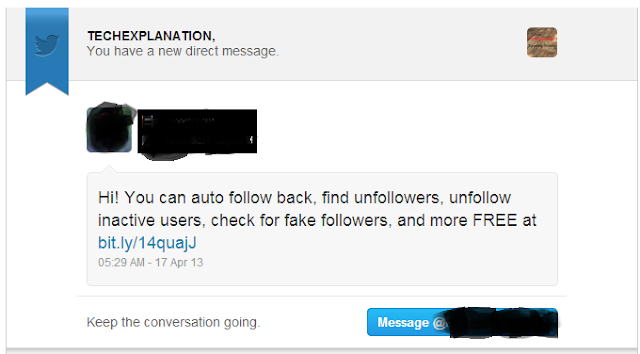 If you are a Twitter user and want auto follow back so this site will help you. Twitterautofollowback.com is a all in one twitter tool. This site has 6 Features. All of this is useful for a Twitter user. Find and Unfollow Inactive Users. If you use this tool and any one follow you on Twitter so you will follow back him automatically. An E-Mail will be sent him that you follow him back. Market yourself as someone who automatically follows back your new Twitter followers and see more and more people follow you because of this. Easily find and unfollow anyone who unfollows you as well as people that you follow who do not currently follow you back.see more and more people follow you because of this. Why bother following someone who hasn't tweeted in months? Easily find and unfollow users you are currently following who are inactive. Curious if someone's follower count is legitimate? Check the percentage of fake, inactive, and real followers of any Twitter account. Visit http://www.twitterautofollowback.com/ and sing-in with your Twitter account. Read Bellow comment before Using. But remember to doublecheck whether using such sites are against the rules and regulations of twitter or not! As far as I know, auto-follow and unfollow softwares, tools or sites are not allowed in twitter and your account can also be banned if you get caught using them! Tahnks Harish, I will notify your this comment in this post.